Mark Elrod, Gary Nelson, and I did my version of planes trains and automobiles to ferry/shakedown Carolina Pacific from Anacortes to Tacoma in anticipation of our Thanksgiving trip to Victoria. 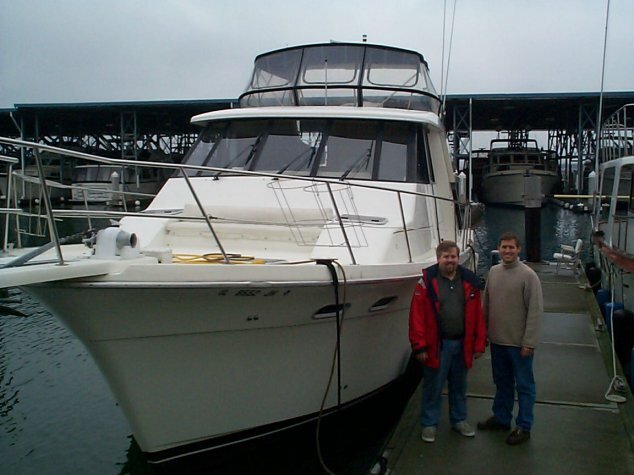 A huge thanks goes out to them and all the other Bayliner Owners Club folks in Washington who came to see, help out, and hang out. Also a huge thanks to Gary both for taking these photos as I forgot my camera, and more importantly for coming along and helping out. This is Elrod and I getting ready to head out. 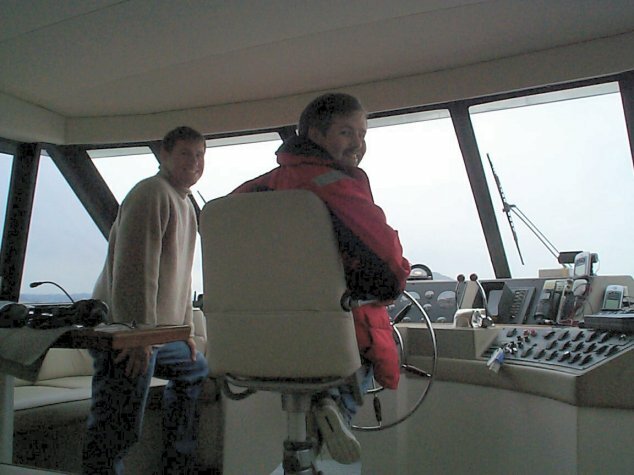 You can also check out a shot of Elrod on watch with me at the helm or that night at the dock in Tacoma. 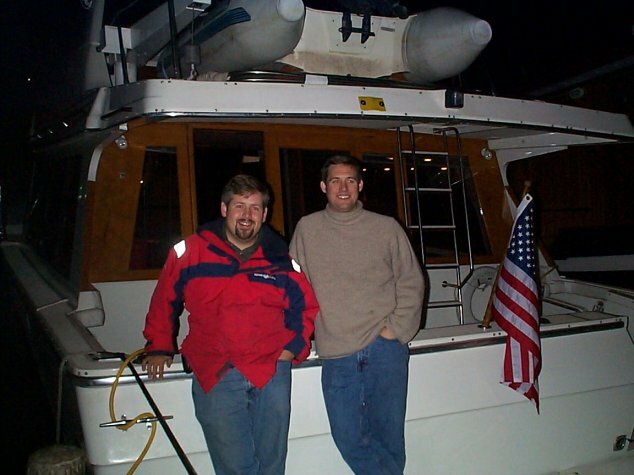 Coming soon - pictures of Peter Astiz on the boat in Canada. Brett Thomas made a good point about the recent ballot here in California. He said that he was offended by all of the spending measures on the ballot in the form of propositions as we had elected and paid legislators to debate these things in Sacramento for a reason. Well, this piece from The Claremont Institute makes both that point and talks about a lot of the real problems with the structure of California government which have a lot to do with a growing unease and dissatisfaction with the high rate of tax and the low rate and quality of subsequent services in one of the most populous states in the union. I had often made the argument with friends and family that many of the NGOs attempts to meddle in economic development in the third world are a bit unfair as we in the U.S. were allowed to exploit our resources to build an economy. This article from Tech Central Station really brings home both this issue and the cost in human lives both the DDT ban and the misplaced hysteria from GM crops. Could it be that environmentalists cause more deaths per year than the U.S. Military has over all time? Though late in the debate, I think this is probably the most compelling piece about the Iraq situation, a possible war, and its imperatives on the Middle East. Al Gore was right in 2000 when he promised to continue using American power to defend liberal democracy around the world. And George W. Bush was wrong when he proposed a foreign policy based solely on narrow national interests. That the two have since reversed themselves is certainly interesting. But it doesn't change what made Gore's original foreign policy progressive during the 2000 campaign and what makes his new stance -- and the stance of most liberals -- woefully inadequate now. You should read the article in its entirety. It is a rather strange realization to have, but it just hit me. As the first winter storm of the season started blustering and raining on the roof here at the house - this is the first rain that my daughter has ever seen. Having children means experiencing everything new again. The New York Times has a true howler of an "article" about the dangers that guns cause as "proven" by the DC "sniper." What's wrong with this piece? 1. 4 paragraphs of fear mongering. 2. Homicide is not necessarily murder. I've read that something like 20% of the homicides are considered justifiable in the FBI data each year. I also think it may include suicides which is a favorite trick of the gun control lobby though I do not have enough time to disect these numbers and find out. 4. The .223 is not a sniper weapon and not a part of "sniper culture," so what does "sniper culture" have to do with this event or any recent event? The .223 is a standard issue infantry weapon and considered a varmiter (shooting rats, snakes, and at the outside extreme coyotes) in private use. 5. Ballistic fingerprinting is really a backdoor to national gun registration. The government only registers things it wishes to tax or deny you the use of. Also, it is a lame attempt to add cost to the transaction and deny weapons to the lower classes who often are in more need of them than those of us who can live in the suburbs and afford ADT. 7. So the final question is, what exactly is there in this article that is either relevant to anything newsworthy or factually based? I guess we have to give Bob Herbert some credit - at least he made sure to get all of the current campaigns of the anti-gun movement in one "article."